Joxer, flanked by his best buds. The Authenticity of the "Joxer Scroll"
 Dr. Janice Covington, with the assistance of Melinda Pappas and Jack Kleinman, discovered the Joxer Scroll in Macedonia in 1942. The Joxer Scroll was originally believed to be part and parcel of the now famous Xena Scrolls, also discovered by Dr. Covington's team. Upon closer inspection, however, it was found that one scroll, containing seven poems, was written in a different hand. There was also a huge signature at the bottom, proclaiming the author to be one "Joxer, The Mighty". Many believe, or hope, that there is more than one Joxer Scroll. There are clues, in fact, suggesting that this one surviving scroll should have a twin scroll carrying accompanying music. But, though historians and archaeologists have repeatedly petitioned that further excavation be allowed in Macedonia to search for any additional scrolls, their efforts have been consistently rebuffed. Perhaps this article will help convince the Macedonian authorities that further investigation is imperative and that knowledge should always come before superstition. Who was "Joxer, The Mighty"? Joxer, international man of mystery. 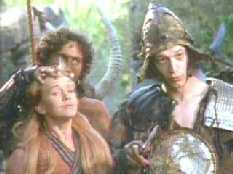 There were many references to a warrior named Joxer, The Mighty in Greek history, verified by mention in the Xena Scrolls. 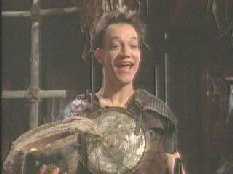 What is confusing are that the references to Joxer, The Mighty in the Xena Scrolls were mostly unflattering. Whoever wrote those scrolls obviously found amusement making fun of this great man and portraying him as a bumbling idiot. Other reports directly contradict this description. We know for a fact that Joxer came from a family of warlords, so obviously he was brought up with an intimate knowledge of the warrior arts. He survived multiple encounters with Callisto, known to be the most vicious and heartless warlord of that time. We know that he was a favorite of Aphrodite, goddess of love, so obviously he would have a greater than normal appeal to women. History has it that the Princess Illeandra of Milos was once so enamored of Joxer that her kingdom was almost plunged into war with the neighboring kingdom of Pyros. He was reported to have bested the King of Pyros, one of the greatest swordsmen who ever lived. He was also reputed to have vanquished ten of the greatest warlords of Greece in the quest to kill the Monster, Baracas. He was known for being a gentleman, unlike many of his contemporaries. He was a talented musician, a patron of the arts, a champion of the underdog, and a true friend. 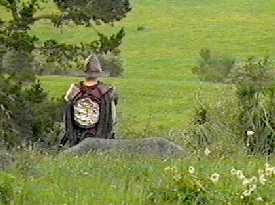 Xena herself declared him to have a heart of a lion, someone she could always count on to watch her back in battle. How then can we reconcile these incredible reports with the apparent disregard and contempt the author of the Xena Scrolls seemed to have for the "bumbling idiot" she constantly claimed Joxer, The Mighty, to be? The answer can perhaps be found in the Joxer Scroll. The Scroll shows Joxer to be a man of intense passion and great sensitivity, and a man of many faces and facets. A more detailed discussion follows as we go through the poems. How did the Joxer Scroll get to be included with The Xena Scrolls? We do not know. The favorite theory, however, is that Joxer, before some great battle, gave his scrolls to a trusted friend for safe-keeping, or perhaps for presentation to his Beloved after he met his expected death on the battlefield. It is also likely that the person responsible for writing the Xena Scrolls came across the Joxer scrolls while collating material for her own work. Whether she had heinous plans for the scrolls or the most noble of intentions is irrelevant. What matters is that thanks to this unknown person the Joxer Scroll survives for our enjoyment today. Why has the Joxer Scroll remained unknown till now? We know that the rest of the Xena Scrolls were brought to public attention when a descendant of Jack Kleinman's presented them to television producer, Robert Tapert, in a desperate attempt to sell a TV show premise. Why was the Joxer Scroll left out? My personal investigation into the matter has resulted in the discovery of a manuscript submitted to Bantam and Doubleday entitled Poetry From The Greek by this same descendant of Kleinman's. Apparently, this descendant - who shall remain nameless for the purpose of avoiding a lawsuit - was more shameless and desperate than anyone knew. This discovery also shed light on the reason why the men of this family have had outstanding success with women. Apparently, three generations of Kleinman males have passed off Joxer's poetry as their own. Is the Joxer Scroll of significance to history and mankind in general? Joxer, well-intentioned if not helpful. It is my belief that had we been able to uncover more of his work, Joxer would be counted among the great poets of Ancient Greece, joining the ranks of Virgil and Homer. With his heroic pursuits, Joxer himself would have joined the list of the celebrated heroes of Greek history such as Perseus, Hercules, Theseus, and Jason. What is perhaps most important, if we could only know the full story behind the writing of the poems in the Joxer Scroll, I am convinced that we would have the greatest love saga of all time. The tale of Joxer and his Beloved would be the ultimate story in romantic chivalry. Sadly, as I have already said, this one scroll is, as far as we know, all that remains of the man: romantic poet, warrior, and hero. Gabby plants a wet one on Joxer. So why do you stand there, looking like that? And, when I drew nearer, why did you pull away? But, for one moment, there was something more to you and me. But, when I did not fight, maybe neither did you. And, never mention that once, I tried for something more. So much fuss about a kiss, if I spoke of love, what would you do? So what if it changed my life, it was just a kiss. First, I must apologize for the weakness of my translation. Obviously, the original Greek poems were of superior quality, the rhymes and scansion perfect. Any lack in the poems you now read are mine. In the first poem we find that the object of Joxer's affection clearly does not return his feelings. Apparently, he had no idea how to deal with this unrequited love and chose to either hide or dismiss his growing feelings. It was a brave and valiant attempt but useless, as we find out in the later poems. With every letter shout, "I love this girl". Words that whisper my love for you. In this second poem, Joxer's feelings have obviously grown stronger, but they are still hidden, most likely, from the world as well as from his Beloved. He has obviously started to record his "testimony" of his love for this unknown woman. His reference to "the words I leave the world" hint that it was never his intention to present these poems to his Beloved. In fact, it is doubtful that he ever intended for anyone else to read these poems within his lifetime. Why? Joxer was not a shy man, nor was he reported to hide behind falsehoods. Why in the world would someone who had so much to offer find it so hard to admit or reveal his love for this unknown woman? Did he even try? It is also interesting to note Joxer's reference to "Bards" and "Kings" proving he knew well the power of the written word. The ancient Egyptians claimed that the Word of the Pharaoh, especially if it was written down, was Law. Centuries later Shakespeare would write that the only way he could preserve the beauty of his love was through the written word - proof positive that Joxer was a man of timeless qualities. To dream on for a mile. And borrow one of mine. And help my heart mend. Yours will always find a friend. You are welcome to stay. The dreams they bring to me. The heart you cannot give. The way it holds me. Joxer tries not to show his disappointment at Gabby scoffing at loving him. In the above two poems we see that Joxer's unrequited love for this unknown (and obviously cold and heartless) woman was starting to wear very heavily on his heart. He had obviously accepted that she would never love him back, and yet he still loved her, lived for her, and hoped for the day that he would be something more to her than a friend. What courage it must have taken, what strength, to remain at her side, constantly offering strength and support without receiving anything back. How heart-breaking it must have been, how humiliating for this proud and courageous warrior to beg for a little affection from someone who was obviously a flighty malcontent. Though outwardly he remained a mighty warrior, brave and valiant, inside he must have been in unspeakable pain. Would it take passion, or intelligence? What would it take for you to love me? What tricks should I know how to do? Tell lies or speak only true? Should I believe, should I pretend? Will you want a life of blood and war? And I'll find ways to give to you. And make me part of you? So love, what should I do? Do I show my love for you? Their colors, nor their shape. It's you who saves the day. So how to show my love for you? How to prove equal to this task? I would give you the stars, my love. You only need but ask. Joxer is ordered by Callisto to 'do' Gabrielle. Let us return to that most mystifying of questions: why would anyone think that Joxer was a bumbling idiot? I believe that the answer is to be found in the above poems. In studying the history of Joxer the Mighty, we learn that he has been many things to many people. Apparently, though undeniably a great warrior and man, he was still insecure, probably suffering greatly from being a middle child. He had a great need to be liked and admired by the people he came across, and, consequently, he had the chameleon-like skill of becoming the person he believed would be most appreciated by current company, or being who the current situation called for. His Mother knew him as a sweet and obedient son; Princess Illeandra knew him to be a brave and gallant knight; Callisto thought of him as a funny, unthreatening oaf; while many others knew him as a fierce and relentless warrior. In the above poems, we know that his Beloved is a strong person, probably a warrior herself. As he stated, he would have saved her, but she did not need saving. He would have fought for her, but she could fight her own battles. What could our hero offer her then? She had a hard heart, or she would have realized his great love for her. Joxer spent much time thinking about what she would have needed and then reinvented himself to be that kind of man. He debased himself, proving he would be no threat, and minimized his abilities, neutralizing any competition. He gave her the one thing that was probably missing in her life: laughter and a friendship that required no exchange. He played the fool because he believed that was the only role open to him. Truly, this was proof of a great man, a true hero, and a selfless lover. Again go off the wall? Or the wind rushing through the trees? Did you really mean you and me? This last poem is especially frustrating. We see a little hope, a little response to Joxer's feelings. Yet, the actuality of this response is in question, even to Joxer. Was it genuine or a delusion produced by henbane? Did he finally receive his just reward, or did our hero finally crack? Sadly, this was the last poem in the scroll, and I fear we may never know the answer. Just as we may never know exactly who his Beloved was. Unfortunately, Joxer hid his love for this unknown Beloved so well, that her identity has never been positively confirmed. There has, of course, been much contention among supposed experts. The most popular supposition is that Joxer's love was for the obscure and mediocre bard Gabrielle. For one, it is believed he kept his own talents as a scribe a secret in order not to hurt her feelings. Since Gabrielle is believed by many to be the author of the Xena Scrolls, it is easy to see how she could portray him so poorly. 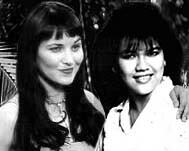 Being so close to Xena, who is no doubt one of the greatest champions of that time, Joxer would have known that brave deeds alone would not win Gabrielle's heart. Gabrielle's propensity for falling in love easily with a number of men would not have encouraged our sensitive hero to admit his great love either. Another conjecture is that the poems were meant for Xena, the Warrior Princess, herself. 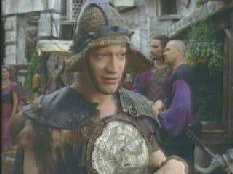 Again, considering Xena's obvious prowess, he would not have competed with her as a warrior. Add to that the fact that she too had a reputation for going after reputable warriors and then dropping them like hot potatoes once she had them eating out of her hand. Though it is most logical that one of these two women would be the object of Joxer's passion, without additional proof we cannot truly be sure. The speculations are as numerous as the Hydra's heads. Some say it was Aphrodite herself who was Joxer's Beloved or some other goddess or nymph. Some claim, pointing to Joxer's apparent interest in silverware and cooking utensils, that his poems were written for Meg, one of King Lias' cooks. Still others whisper of a secret love, one not written on any scroll or any book. Though we cannot as of yet tack on a happy ending to the story of Joxer's scroll, we can only hope that whoever she was, this Beloved, somewhere along the line she realized his immense love and mended her cold-hearted ways. We can hope that she finally knew what sacrifices he offered in her name and rewarded our hero appropriately, returning his love in equal measure. After years of working 16-hour days and six-day weeks, Jessi Albano has decided to take a vacation. Right now she keeps busy with the Educational Technology consultancy company she just started, writing copy for three advertising agencies and trying to write an entire second season for her other favorite TV show. 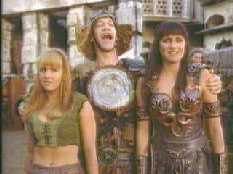 Least favorite episode: Any episode where Callisto dies!